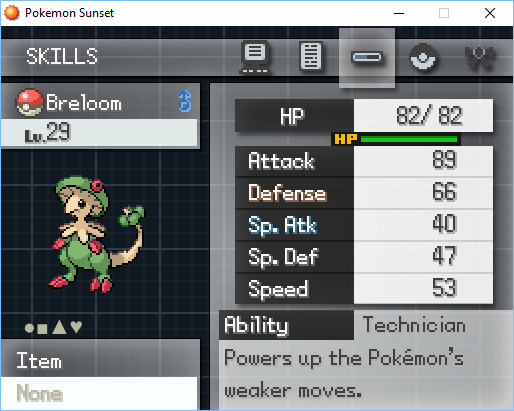 Introduction: This game is a double-battle focused Pokemon game, with the option to fight alongside Partners that join you throughout your Journey. 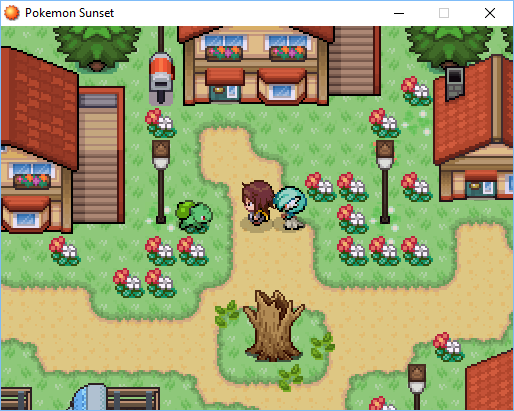 You'll be able to view and level your Trainer's Pokemon as well as adjust them by using TM's and giving them held items. With adjusted experience formula, you'll be able to train up Pokemon under level 50 quickly so you can adjust your party to beat specific opponents. 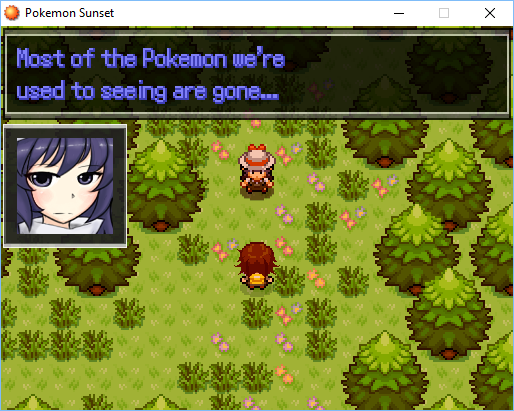 Plot: Various things have been disappearing all over Orange Peak. Is it a Pokemon? A thief? Investigate with Yuki as one discovery leads to a never ending spiral of mystery. 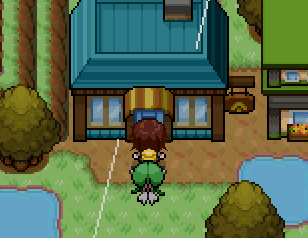 - Adjusted multiple Pokemon to evolve normally by leveling without having to trade, happiness, etc. - Can't use items on Partner's Pokemon in battle. - Plan to add more Partner content. 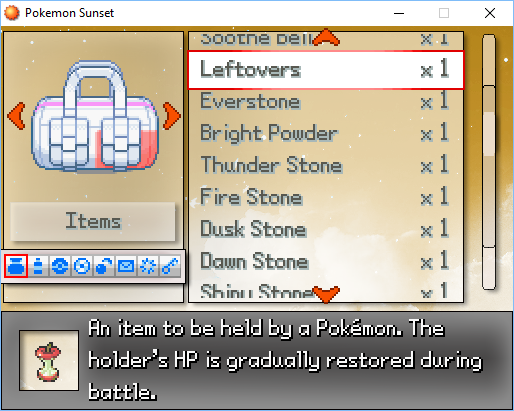 - Autosave and ways to back up trainer data. This game is at its experimental stages. It is bound to have multiple bugs and not very much content. 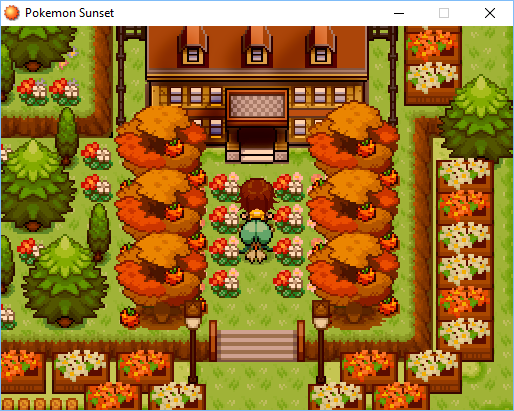 It's my first Pokemon game so I thought I'd post here and get some feedback before I advance my game further. Please save often and consistently check your Partner's Pokemon party to check for errors. Since I'm working on this game alone, I predict that my progress with this game won't be as fast as I would like... I would appreciate it if I can get some help from others in scripting, plot progression and battle balancing. -MissingLukey, help-14, Kymoyonian, cSc-A7X, 2and2makes5, Pokegirl4ever, Fernandojl, Silver-Skies, TyranitarDark, Getsuei-H, Kid1513, Milomilotic11, Kyt666, kdiamo11, Chocosrawlooid, Syledude, Gallanty, Gizamimi-Pichu, 2and2makes5, Zyon17. Various BGMs from Kingdom Hearts, Maplestory. - Added "move there immediately" option for various scenarios. A: There are some locations where the game slows down (notably Clary Town). Fix coming in the future. 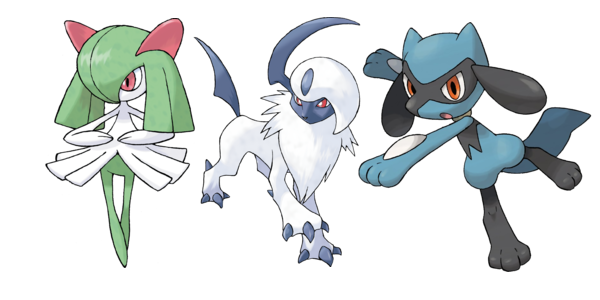 Do absol and riolu get additional evos/pre evos since ralts has 2? I've adjusted Riolu's and Absol's stat spreads to match Kirlia's and gave Absol a new evolution. Basically all starters will have one evolution at level 30. I thought it'd be fine since Pokemon evolve to level 16 really quickly so there wouldn't be much problem with balance. This game looks very promising. I can see that a lot of work is being put into it! I'll definately be checking back from time to time to see your progress! Eh? That's weird. I kept the same base rate (25%) that was in essentials. 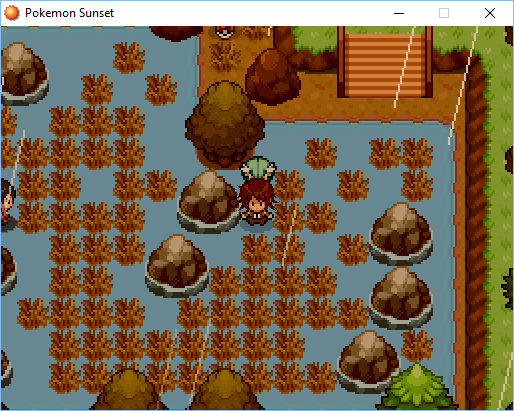 I can adjust it later but I've added some empty spaces you can traverse to avoid the grass a bit. This project seems quite prosmising! I'm really intrigued by the focus on double battle here, it's something a little different than other fan games and I'm quite interested to see what it would be like to have double battles all the time (I've never played XD). I'm a bit confused about the choice of starters, however. I get the Psychic/Dark/Fighting type triangle you're going with, but I'm not sure why you've chosen Pokemon with all different evolutions and completely different feelings to them. Judging from the fact that you've given Absol an evolution and Kirlia, not Ralts is the starter, I'm guessing you're aiming for two stage evolutions. Why not switch out Kirlia for Spoink or Claydol, and Absol for Poocheyna or Murkrow? 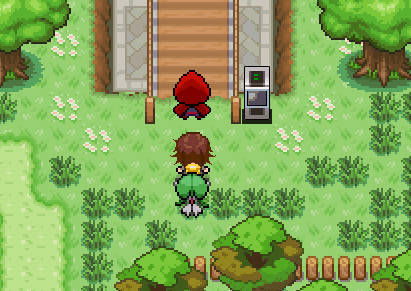 That way, you wouldn't have to edit the Pokemon so much to keep with the type triangle and two stage evolutions. It would just make more sense to me. Well, for the starters, I thought I'd use Pokemon that I like over trying to focus too much on the triangle. 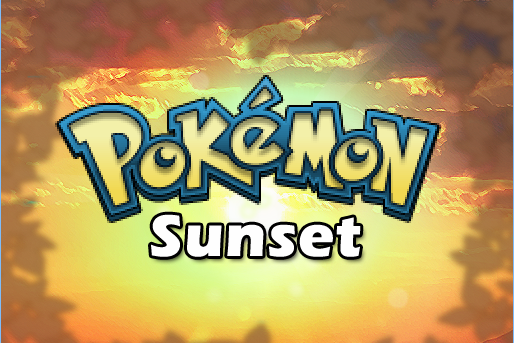 So I'm playing this and enjoying the art and interesting story, I figured I'd just point out that it's almost impossible and kind of frustrating to try and catch other Pokemon. They break out of their balls regardless of if their health is in the red and with the double battle mechanic, even if there's one enemy Pokemon left standing it'll say "it's impossible to aim!" 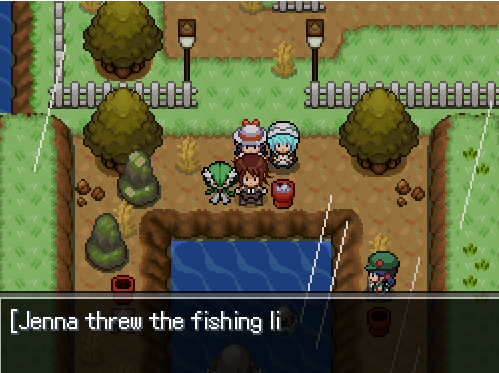 and seemingly waste your Pokeball? 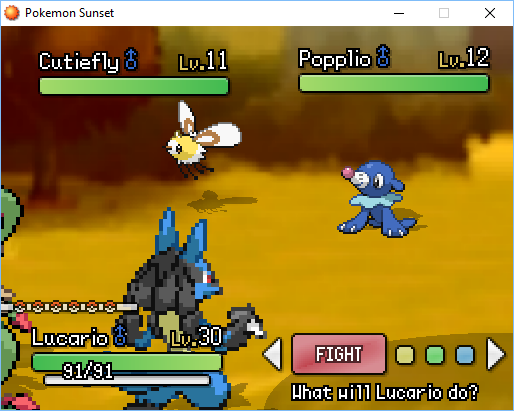 And sometimes partner Pokemon's moves get skipped over in a double battle as if it's not functioning fluidly. May I ask for some pictures? I see, I knew that people would have that problem. Basically, what is supposed to happen is during double battles, you can only throw one ball per turn but it doesn't skip your partner's turn. But I made a workaround solution until I can fix that problem. 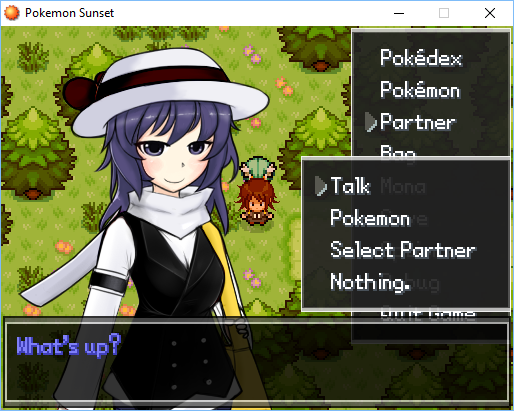 If you go into the partner's tab --> Options --> Solo Wild battles, you can choose to encounter wild pokemon by yourself if you select "Solo Battles"
Only wild encoutners will be solo though. All trainer battles and event encounters will be doubles I think. Ah see I figured that would be the solution, but after the point where you have to get the professor's coffee there's no option for editing your partner tab. I did try first instead of coming here to complain, I swear! I didn't get to play test this game too much because I didn't have time. It's bound to have multiple bugs. I made a quick fix for the missing partner tab. Download this System.rxdata and replace it in the data folder. 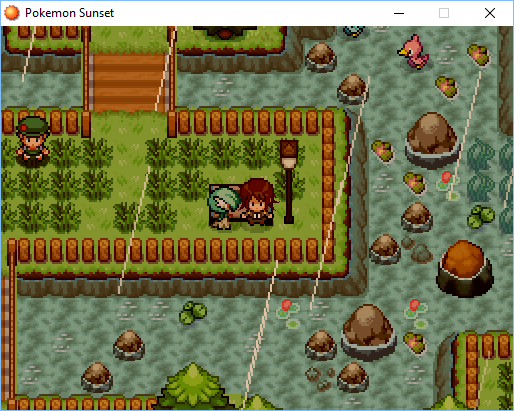 Then talk to the Bulbasaur next to your house. It should return your partner tab. In the meanwhile, I believe you can use your mouse cursor to select moves and etc. so until I can figure out what's wrong, I recommend you use your mouse cursor. 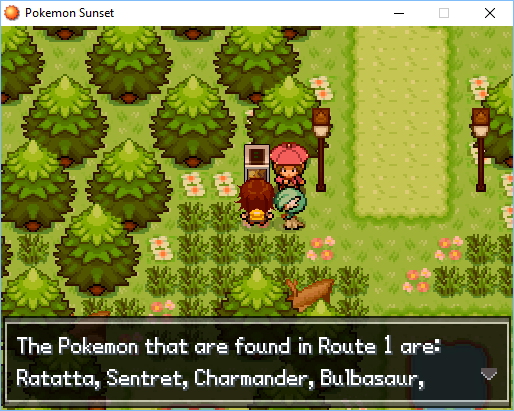 The bulbasaur in the tutorial isn't supposed to be a shiny, is it? I also found a Lv. 100 Decidueye in Crystal Falls South. Is this a bug?